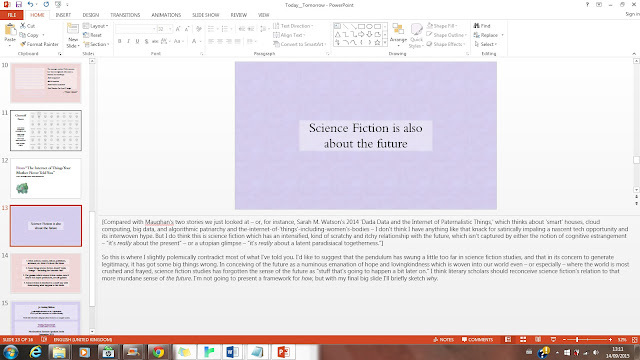 The short talk I gave for the Northumbria Summer Speakers Series is now up on Academia.edu (with the bits I cut out put back in) mostly about science fiction and its relationship with the future. I'm hoping to revisit some of the theoretical material here on the blog, at greater length, if not much greater rigor, before too long. Elsewhere: MIT Twelve Tommorows 2016 / "We've been trying to elude GHOST HARDWARE, but as Tim Maughan discovers, that's easier said than done" / Dada Data and the Internet of Paternalistic Things. One of the other speakers at the event was the author Jane Alexander whom you'd better check out right now. And Rasheedah Phillips, talking at Ferguson is the Future, probably sums up the whole science-fiction-as-acts-provoking-the-future thing way better than where I left it, with design fiction. "The teen mother surviving and not becoming another statistic, and not dropping out of high school, that science fictional story needs to be heard." (Panel 1, beginning at around 30:00).